A well presented and EXTENDED THREE DOUBLE BEDROOM family home offering spacious accommodation of just under 1,800 square feet, and situated in one of Storrington’s most sought after residential areas. The front door opens into a porch, ideal for hanging coats and leaving shoes, and a further door takes you through to the ENTRANCE HALL with stairs rising to the first floor and a door into the separate WC. The large open plan LOUNGE/DINING ROOM is of dual aspect with a large window to the front aspect and patio doors to the rear leading to the CONSERVATORY with its views onto the rear garden. The KITCHEN/DINER has been extended by the current owners and offers a wealth of modern high gloss units with granite effect work surfaces and a coloured tiled splash back. Integrated appliances include an induction hob, eye-level oven with built-in grill function, steam oven, warming draw, and a dishwasher. There is space and plumbing for a washing machine and space for a fridge freezer. There is also under floor heating to the kitchen and dining areas. Leading off the kitchen/diner is a handy covered UTILITY AREA/STORAGE AREA with access to both the front and the rear of the property and also access to the single garage. 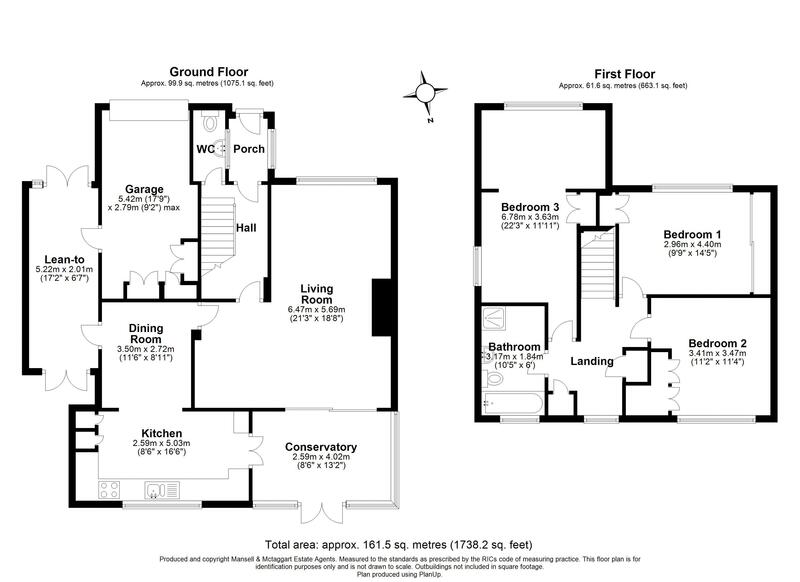 To the first floor, there are THREE LARGE DOUBLE BEDROOMS, one having been extended to the front offering a room which could be described as two double bedrooms joined together. There is also a refitted FAMILY BATHROOM benefiting from both a walk-in shower and a bath. OUTSIDE, the rear garden is mainly lawned with borders stocked with an abundance of shrubs, and a SUMMER HOUSE. To the front, there is PARKING FOR SEVERAL VEHICLES and leads to the SINGLE GARAGE. Greenfield Way is situated within walking distance of the village centre which offers a good range of shops, including Waitrose and Boots, public houses, restaurants and tea rooms, butchers, bakers and other independent traders such as gift shops, delicatessen, newsagents. There are also schools, doctors’ surgery, dentists, Post Office and a library. For the commuter, the nearest mainline station is approximately 5 miles distant at Pulborough offering a frequent service to Victoria/London Bridge whilst also connecting to Gatwick Airport and the south coast. The A29 and A24 are readily accessible, connecting to Worthing, Chichester and Horsham. Recreational facilities in the area include Chanctonbury Leisure Centre and gym on the western fringe of the village, the West Sussex Golf Club nearby, gliding, horse riding and walks across the South Downs National Park. Further afield, Goodwood is home to horse racing and the renowned Goodwood Festival of Speed and Revival motorsports events. Sailing and theatre are at Chichester, Littlehampton and Brighton.